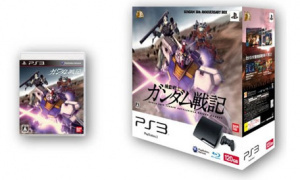 This Gundam Bundle Will Probably Get The Japanese Flocking. Discovered by Andriasang, the super bundle "Kidou Senshi Gundam Senki Gundam 30th Anniversary Box" (breathes) includes Namco's upcoming mech-fest Kidou Senshi Gundam Senki, a few download codes for some extra DLC and an animated film in HD. The perfect package right? Oh, note the new branding on the game's box. We hinted a total PS3 rebrand didn't we. Sony have been super-aggressive in recent weeks. It's great to see.